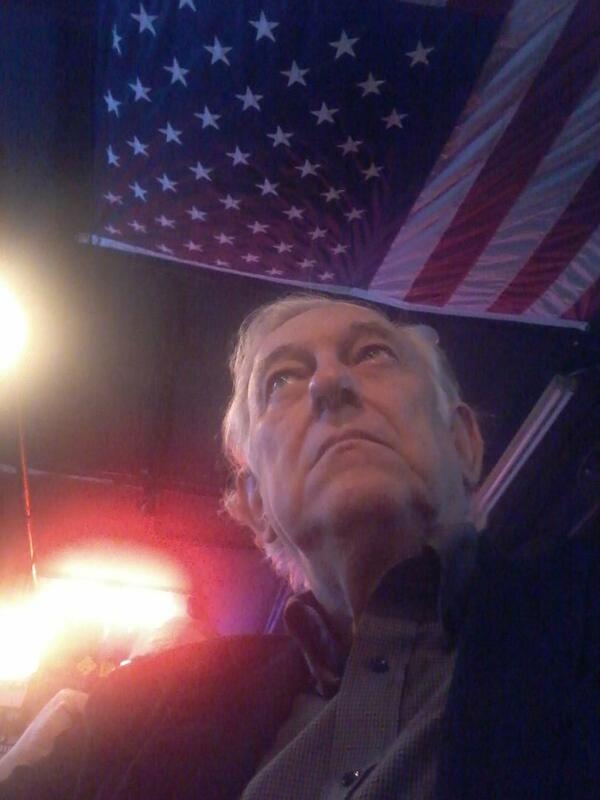 A Disgruntled Republican in Nashville: Donald Trump can't get the facts right about NAFA. It was not "Clinton's NAFTA," and it was not a "bad deal." Donald Trump can't get the facts right about NAFA. It was not "Clinton's NAFTA," and it was not a "bad deal." 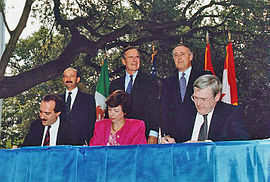 Following diplomatic negotiations dating back to 1990 among the three nations, U.S. President George H. W. Bush, Canadian Prime Minister Brian Mulroney and Mexican President Carlos Salinas, each responsible for spearheading and promoting the agreement, ceremonially signed the agreement in their respective capitals on December 17, 1992. The signed agreement then needed to be ratified by each nation's legislative or parliamentary branch. After much consideration and emotional discussion, the House of Representatives passed the North American Free Trade Agreement Implementation Act on November 17, 1993, 234-200. The agreement's supporters included 132 Republicans and 102 Democrats. The bill passed the Senate on November 20, 1993, 61-38. Senate supporters were 34 Republicans and 27 Democrats. Clinton signed it into law on December 8, 1993; the agreement went into effect on January 1, 1994. President Bill Clinton signed the bill that implemented NAFTA but NAFTA was negotiated under George H. W. Bush, pushed by Bush, ceremonially signed by George H. W. Bush and passed with majority Republican support in the House of Representatives and the Senate. To his credit Clinton signed it into law, against the wishes of his party saying, "NAFTA means jobs. American jobs, and good-paying American jobs. If I didn't believe that, I wouldn't support this agreement." To call NAFTA, "Clinton's NAFTA" distorts the facts. In the years since NAFTA, U.S. trade with its North American neighbors has more than tripled, growing more rapidly than U.S. trade with the rest of the world. Canada and Mexico are the two largest destinations for U.S. exports, accounting for more than a third of the total. Most estimates conclude that the deal had a modest but positive impact on U.S. GDP of less than 0.5 percent, or a total addition of up to $80 billion dollars to the U.S. economy upon full implementation, or several billion dollars of added growth per year. ... the North American Free Trade Agreement has been a success by any measure. Trade among the United States, Canada, and Mexico has flourished since the passage of NAFTA, benefiting American consumers and exporters. Since 1993, two-way trade with our NAFTA partners has increased by 44 percent, to $421 billion in 1996. That compares with a 33 percent increase in American trade with all other countries.2 Mexico has now become America’s second largest market for exports, just ahead of Japan and behind only Canada. NAFTA has been modestly beneficial for the U.S. economy, even though Mexico’s economy is relatively small compared to the American economy. It is obvious today that the “giant sucking sound” predicted by Ross Perot has not been heard. Since the passage of NAFTA in 1993, the real gross domestic product of the United States has expanded by 12 percent and civilian employment has grown by more than 8 million, including a net increase of half a million jobs in manufacturing.3 Inflation has remained subdued at 2 to 3 percent, thanks partly to the price competition of imports. The job “losses” that critics of free trade blame on NAFTA are mostly fictitious, based on the misuse of trade deficit numbers. About 150,000 Americans have filed for benefits under a program for workers allegedly displaced by increased imports from Mexico and Canada. As painful as the displacement may be for those workers, the U.S. economy during the last four years has created that many net new jobs approximately every three weeks. What gets totally lost in the populist focus on anecdotes such as the Carrier story are three much larger trends. First, the U.S. has added 31 million payroll jobs since 1994, or 29 million workers (depending on which methodology one uses). Second, average hourly earnings, adjusting for inflation, are 43 percent higher than in 1994. Third, U.S. manufacturing output has reached record highs, and part of the reason is that so much global trade consists of intermediate goods in fantastically efficient supply chains. The Wall Street Journal writes: Memo to Trump: Nafta Helps Americans. Without the North American Free Trade Agreement (Nafta), manufacturing would be in even worse shape. .... Mexico is not about to voluntarily foot the bill for any such wall. But Mr. Trump says that he can make our neighbor pay by imposing new tariffs on its exports to the U.S. In other words, Mr. Trump plans to launch a trade war with Mexico. ...preposterous an idea as it is dangerous. ... According to “NAFTA Triumphant,” a report last month by the U.S. Chamber of Commerce, annual U.S. trade with Canada and Mexico is now $1.3 trillion, nearly four times greater than before the agreement. Agricultural exports to Canada and Mexico have gone up by 350%, and U.S. service exports have tripled. More than a third of U.S. merchandise exports are now bought by Nafta partners. Mr. Trump’s trade agenda is absurd and would invite a depression. He’s either too uneducated in economics to know that or too cynical to care. I am firmly convinced that Donald Trump is a dangerous man. The last sentence above in the WSJ article sums up my view of Donald Trump.